The Tarragon Theatre is currently presenting the inauspicious world premiere of Sean Dixon’s drama A God in Need of Help. Dixon has based the play on an historical anecdote from the early 17th century that touches on the meaning of art, the role of faith, the conflict of secular and religious power, the conflict of Protestantism and Catholicism and the survival of paganism in the Christian era. In itself, the subject matter is fascinating. Dixon, however, has chosen to explore it in unoriginal manner it which there is no conflict or suspense. The time is 1606 and the four strongest men in Venice and their Captain stand before the Magistrate of Venice and the Cardinal-Archbishop of Milan in an inquiry into whether a miracle occurred during a task they had been assigned. Holy Roman Emperor Rudolf II (1552-1612), an avid art collector, had bought a painting, The Brotherhood of the Rosary (also known as The Feast of the Rose Garlands), that German artist Albrecht Dürer (1471-1528) had completed in 1506 while in Venice where it served as the altarpiece of the church of San Bartolomeo. For fear of having it stolen or damaged, he insisted that the heavily packaged painting be carried from Venice over the Alps to his residence in Prague by the four strongest men in Venice. A competition was held in Venice to determine who were these strong men and they set out. In history the four men completed their journey and the painting now hangs in the National Gallery in Prague at the Sternberg Palace. In Dixon’s version they had been stopped halfway through and the painting is returned to Venice by Venetian troops. Dixon has the group of five men set upon in the Alpine village of Pusterwald by Protestant zealots. Followers of the Protestant Swiss theologian John Calvin were motivated to destroy religious art by the Second Commandment: “Thou shalt not make unto thee any graven image, or any likeness of any thing that is in heaven above, or that is in the earth beneath, or that is in the water under the earth” (Exodus 20:4). In Dixon, the Protestants want to see the work before they destroy it, except that a miracle happens that stupefies everyone and causes the Protestant attackers to convert to Catholicism. The Republic of Venice has been in constant conflict with Rome and often refused to follow its edicts. In 1606, before the action of Dixon’s play, Pope Paul V had excommunicated the population of the entire city. Therefore, the Magistrate Zen of Venice (John Cleland) is really only interested in whether the four strongmen had carried out their orders. The Captain (Dmitry Chepovetsky) has already been punished for failure to do so. Only the Cardinal-Archbishop Borromeo (Greg Ellwand) is concerned with investigating whether a miracle did or did not occur. He conducts his investigation by interviewing each of the five men – the workman Marco (Alden Adair), the Captain, the actor Dolfin (Tony Nappo), the soldier Cocco (Daniel Kash) and the strange boy Rafal (Jonathan Seinen). The result, as this structure always shows, is five versions of the “truth”. It is a structure best known from Akira Kurosawa’s film Rashōmon (1950) based on a 1922 story by Ryūnosuke Akutagawa. The device has been so commonly used since in plays and film that critics speak of the “Rashomon effect”. It is a great pity that Dixon should have adopted this device because it prevents him from focussing on his most interesting point – the survival of paganism in Christianity that comes to light in the last interview, Borromeo’s discussion with Rafal. Various theories emerge from of the five interviews. The pious Catholic Marco believes it was truly a miracle. The Captain had a plan to abort the mission and have the painting taken most of the way by cart, except that the “miracle” thwarted his plans. Dolfin thinks that Cocco and Rafal had fallen in love with each other. And Rafal says that not Cocco but the Captain had had his way with him. Rafal’s big revelation, we don’t really care any longer about the story. Rafal’s contribution, rather than being exciting, comes off as preposterous. Knowing by the end where Dixon was heading, we have to wonder why he does not emphasize the others’ view of Rafal more. Three of the strongest men in Venice are burly. Rafal is a slip of a boy. Why does no one question more seriously how he was able to win fourth in a contest of strength? Why does Dixon not emphasize more clearly Rafal’s difference from the other men if only to build up our curiosity to know who he really is. Since Dixon does not, the play lacks suspense and is dramatically inert. With a wonderful reproduction of Dürer’s painting on stage throughout the action, Dixon has ample opportunity to comment on the nature of art. Instead, he decides that people of 1606 would have a problem with the anachronisms of a painting from 1506. 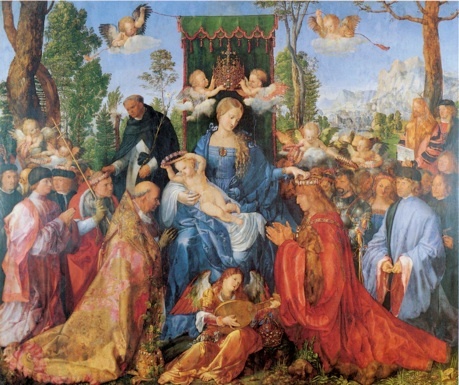 Dürer shows an enthroned Virgin Mary with the baby Jesus being venerated by Pope Sixtus IV (1414-84) on the left of the throne and by soon-to-be German Emperor Maximilian I (1459-1519) on the right. Saint Dominic (1170-1221), founder of the Dominican order of monks and the traditional inventor of the rosary, peers on behind the crowd on the left. In bringing up this subject, Dixon makes a false assumption. Paintings from the Middle ages through the Renaissance were always recognized as having a symbolic component and people knew this. Since the subject of the painting is the rosary, of course its inventor would be there along with the pope who helps popularize it. More remarkable is that Dixon fails to mention that the painter Albrecht Dürer himself is in the painting on the far right hand side level with Saint Dominic. If Dixon were serious about analyzing the painting rather a lot could be argued whether it shows hubris or not for Dürer to picture himself along with these other worthies, or whether he deserves to picture himself since his art has made what we are looking at possible. The general torpor of the show is not helped by Dixon’s failure to create interesting characters. John Cleland’s Magistrate is simply a stereotypically harsh Renaissance politician. Alden Adair’s Marco is typified only by the zeal of his piety, crossing himself more often than necessary, and by his fake peasant’s language where he seems unable to get the number and tense of any verb right. Dixon gives Tony Nappo as Dolfin almost nothing to work with even though Dolfin is supposed to be an actor. Daniel Kash’s Cocco is a stereotypical old salt, who keeps harping on about his participation at the battle of Lepanto (1571). Dmitry Chepovetsky’s Captain could have been intriguing, but is not. What is the nature of his attraction to Rafal? If he is a Protestant, why does he kneel in awe when the “miracle” happens? We have no answers to this. That leaves only Greg Ellwand’s Borromeo and Jonathan Seinen’s Rafal to intrigue us. At the end of the play Borromeo’s relation to Rafal starts to morph into Martin Dysart’s relation to Alan Strang in Peter Shaffer’s Equus (1973) – an older rational man fascinated by the magical world that the young man lives in. At this point we wonder why Dixon did not make this encounter the centre of the play. 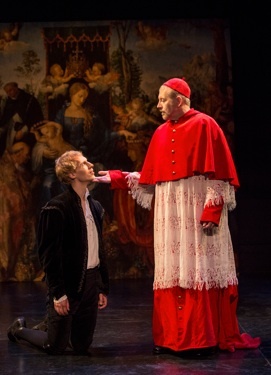 Ellwand’s Borromeo is all gentleness and understanding in contrast to Cleland’s Magistrate’s cruelty. Director Richard Rose, however, has hobbled Ellwand’s performance by placing him in the centre of the audience, his chair attached by a runway to the stage. This means that throughout his investigation of the characters no one in the audience can see his face, and thus one of the most potent means of creating drama is lost. Jonathan Seinen manages to glow with mystery even when the text gives him nothing or little to say. Since his interrogation comes last, Dixon doesn't even have time to bring up the pertinent question whether someone with Rafal’s fantastic beliefs is mad or not. When he at last presents his side of the story, it is the most riveting of the five, and certainly the most unusual, but Dixon ends the play before we have time to consider Seinen’s character and what he says fully. That may be just as well because if what Rafal says is true, it makes nonsense of the entire plot. Dixon’s topic in A God in Need of Help has so much potential it is a pity Dixon makes so little use of it in the play. The best reason to see the play is to realize what a fascinating period the early 17th century was. Rudolf II alone, with his obsession with art and alchemy, would made a great subject for a play. Luckily, the Tarragon programme provides two pages of historical glosses, but they, like the play itself, will leave you wanting more. Photos: (from top) Ben Irvine, Daniel Kash, Tony Nappo, Jonathan Seinen, Dmitry Chepovetsky and Alden Adair, ©2014 Cylla von Tiedemann; Das Rosenkrantzfest by Albrecht Dürer, ©The Yorck Project; Jonathan Seinen and Greg Ellwand, ©2014 Cylla von Tiedemann.